Rob de Veij has released version 2.8.1 of his stellar virtualization utility RVTools. I love this free tool as it provides valuable information about my infrastructure in a fast and easy format. – On vSphere VMs in vApp where not displayed. – Filter not working correct when annotations or custum fields contains null value. – When NTP server(s) = null the time info fields are not displayed on the vHost tabpage. – When datastore name or virtual machine name containts spaces the inconsistent foldername check was not working correct. – Tools health check now only executed for running VMs. Go download this tool today and be sure to tell Rob how much you appreciate his development efforts! VMware, much of this information is vital as it pertains to configuration maximums and should be available in the VMware vSphere Client for capacity planning purposes. Last Sunday I wrote about my VCDX Defense experience. This evening I am fortunate enough to share the news that I have passed the final board review and have achieved VCDX certification. 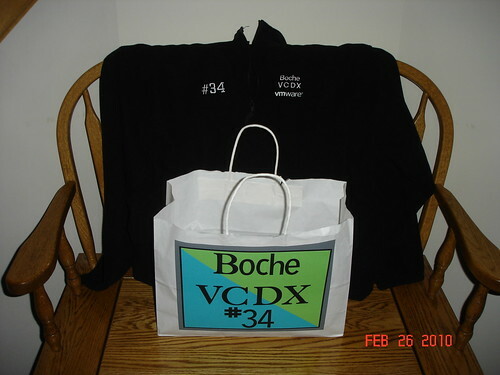 I was awarded VCDX #34. For the others who defended last week in Las Vegas, I offer my congratulations to you all on a job which I’m sure was well done. Without a doubt, it was a journey which I’m sure will benefit me for many years to come. I’m proud to have walked down a path paved by so much collective brilliance before me. I am inspired and driven by the knowledge shared in the virtualization community. I hope that I can continue provide the best I have to offer in return. It is not my intent to turn this into the Acadamy Awards, but I would be extremely negligent if I didn’t thank key people who devoted their time to ensure my success by reviewing my design, challenging me with questions, as well as those who provided tips and encouragement for the defense. I had several weaknesses exposed and with your help I was able to strengthen in those areas prior to my defense. 1) Know your design, I mean really know it. Last Wednesday morning in Las Vegas, I participated in my VMware Certified Design Expert (VCDX) Defense. A successful Defense is the last in a series of required steps to obtain VCDX certification. Defense experiences have been shared by others such as Rick Scherer, Dave Convery, and Duncan Epping. I found my own Defense experience to be similar to theirs. Prior to the Defense, I submitted an application and a design for the panelists to review. As Dave Convery pointed out, this may be the hardest part of the entire process as far as the volume of work goes. The design is a complete set of documentation that must meet key requirements outlined in the application. There is not a lot of time to complete the application and design once you are invited for that step. My best advice would be to clear your schedule as much as possible to crank out quality documentation. Also, be sure the application is filled out completely and the design covers all requirements. Missing information risks outright rejection and you’ll likely miss the opportunity for the upcoming defense. It is absolutely critical that all fields in the application are completed. This cannot be stressed enough. The panelists will spend up to 8 hours reviewing the design. The submitted documentation is more about quality than quantity. Be sure the documentation submitted is relavant to the design. Any information the panelists cannot pull from the submitted design will need to be clarified during the defense which is then a pressure situation for the candidate. Once the application and design is accepted, the defense date is scheduled around a major VMware event. Typically VMworld or Partner Exchange (PEX). My defense was scheduled at PEX in Las Vegas. As I am not a partner nor do I work for a partner, I did not attend PEX or any of its sessions. I flew in on a Tuesday morning and left a day later, merely for the defense. This strategy is fine with me as I would rather stay focused on the defense and my design, and not face daily distractions and new information released at a conference. During the days leading up to my defense, I felt very confident. I had been studying my design and going over all the Enterprise Admin and Design exam study material on a daily basis. I had been brushing up on white papers and blog articles for areas which I felt I was weak on or had forgotten details of. I brought a 3 ring binder filled with about 400 pages of documentation as well as every VI3 published .pdf known to mankind on my thumb drive. While I didn’t read all the .pdf files, they were with me if I needed them for reference. As it turned out, a few of the documents I crammed on the night before my panel would play a nice role during part of my defense. After arriving in Las Vegas Tuesday morning, my confidence level remained as high as ever. I had spent the entire 3 hours on the plane reading out of my 3 ring binder. Outside of having breakfast with a friend, I spent a good portion of Tuesday studying which was my intent in booking a Tuesday morning arrival. Early Tuesday afternoon, exhaustion hit me like a ton of bricks. I decided to try to take a nap. I laid in bed for close to an hour and couldn’t fall asleep. I decided to try a long bath in my swanky bathroom with a TV in it (my favorite part of the trip I think). I got my second wind and attended a meeting Tuesday evening for about an hour where I met up with fellow vExperts. Asked how I felt about the following morning’s defense, again my answer was mostly confident, cool, and collected. I just wanted to get it over with. The anxiety of the approaching defense date was starting to mount. I found myself calculating the hours remaining in my head. “In 15 hours I will have started my defense. In 17 hours I will have finished the first defense section. In 18 hours it will all be over with.” After the meeting, some of the guys were going out on the strip for a nice dinner. I really wanted to go but knew had no time for this social event. I hung back and had a quick buffet dinner with a guy who I would find out was a VCDX himself and a panelist from VMware. I was back to my room by 8:30pm and studied until about 10:15pm. At that point, I was getting tired and decided to take the wise advice of Rick Scherer and John Arrisjid by getting a good night’s sleep. I was getting good sleep until… I woke up at 3:30am and couldn’t fall back asleep. I laid in bed for a full 2.5 hours thinking about my upcoming defense, points I wanted to make, design choices, etc. It’s a long time to dwell on these items but it was quiet and peaceful and I was well rested. I shot out of bed at my 6am wake up call, got ready, packed, and headed out. I stopped by the hotel business center to print 4 copies of a presentation slide update I had made the night before. I forgot to print current slide only and instead printed 4 copies of the entire deck. Expensive lesson printing 60 pages which couldn’t be cancelled (how convenient for the hotel). At least they were in B&W and not color. The plan was to get a good breakfast to calm any nerves that may develop (advice from Rick Scherer). Unfortunately, there was no breakfast open at 6:30am. The restaurants didn’t open until 7am. I headed to Starbucks to start getting caffienated. While having coffee and going through my slides, I decided to create 3 new slides right then and there. I felt they would be beneficial for the executive presentation but a small part of me challenged “is this really wise throwing these in at the last second?” Why not. SEs do it all the time prior to arriving at customer sites. At this point I still felt pretty confident and didn’t really have any nerves. At 7:30 I finished my coffee and headed to breakfast. Last minute cramming at the breakfast buffet table downing coffee and some food. As the clock passed 8am, I had less than an hour left to head upstairs for my defense panel. I could start to feel the nervousness set in. I continued to study until I realized it was 8:50am and I had less than 10 minutes to get through the casino over to 2nd level of the convention center. Whoops. I arrived at Breakers L with maybe 2 minutes to spare and Melissa greeted me. The panelists were waiting inside and not quite ready for me yet. In the mean time, I walked across the hall and poked my head in a large auditorium to see who was speaking. It was Steve Herrod talking about a technology which I cannot repeat at this point in time. I told myself repeatedly that I am not nervous but I was only lying to myself. It’s inevitible. When the exam room doors open and you see the panel of experts in there, you feel it. I surmise it may be a bit like meeting the Father, the Son, and the Holy Ghost for the first time. People who spend a lot of time in front of customers are still nervous for these defense panels. It’s unavoidable. One candidate who finished his defense Tuesday evening likened the experience to having “a proctology exam”. The first 75 minutes is spent “defending” my design. I’ve got about a 15 slide deck to get through and to use as reference throughout the design defense. I recommend putting as much reference as you can in the slide deck which you can yourself refer to during the defense. It will help illustrate design choices and jog your memory for design elements which you’ve forgotten due to nervousness. The first 5-10 minutes I was pretty nervous and stuttered once or twice during my presentation. After that, I warmed up and it felt more like a good technical discussion with co-workers which I enjoyed. As the questions started coming in, I made good use of some of the slides to help explain decisions. Good slides to have here are architecture diagrams, network, storage, etc. I felt my performance during this section of the defense was passable based on the questioning I received, but the honest truth is it’s too hard to tell with the scoring method that is used. It’s about accumulating points. What’s unknown is how many points were left to accumulate and areas to talk about which we did not get to due to the 75 minutes of time expiring? Afterwards, I can’t help but think about 1 technical question I knew I jumped the gun on and answered incorrectly, failing to correct myself. I’m told by a current VCDX to not worry about it, nobody is perfect in the defense – that is to say, the scoring of the defense will allow for X number of mistakes. I’ve also spent time playing back other areas of the defense, wondering if I clarified my points clear enough? Trying to remember if the panelists understood that one of the points I was making was in the context of a specific circumstance and it would be important that they would understand that for it to be technically correct. Did they understand the physical network topology well enough between sites or draw a harmful conclusion that I was contradicting myself during explanation? I can’t stress enough how fast the time elapses in front of the panel. At least it did for me. After the 75 minute defense, we took a short break and proceeded with the 30 minute mock design. In retrospect, the scenario which was thrown at me wasn’t too bad. Unfortunately I didn’t get through nearly as much of it as I wanted to. I spent a lot of time digging in areas where there were probably no more points to be had I should have just moved on. I wish I had another shot at it and I would have moved faster. The idea in this section is to ask a lot of intelligent questions to frame out a design in 30 minutes. But don’t spend too much time in one area. This section is more about “the journey” than the final design. Questions need to be asked of the “customers” during the design process so they can see how you think on your feet. They may also not provide all of the needed information for the design which is, again, where asking questions comes in. Once again, time flies. Be quick but be as thorough as possible. Think out loud. After completing the 30 minute mock design section, we moved right into the last section which is a 15 minute troubleshooting scenario. The three panelists are once again the customers in this scenario and they came to me with a VMware Infrastructure 3 problem they are experiencing. Once again, this process is more about “the journey” than the final result. It’s about thinking out loud, asking questions of the customer, and showing them the throught process to isolate root cause of a problem. I feel I did well in this section and will go so far as to say that I found the root cause. Before I could get acknowledgement, however, the 15 minute timer expired. I do not know how each section is weighted, if it is, but hopefully I did do well enough on the last section to help carry me through the two previous sections. A common occurrance through the Enterprise Admin and Design written exams was that I felt I did poorly in one section, but stellar in another, which carried me through to a passing score on each written exam. The panelists and observers were a good group of people and I can honestly say that once I got beyond that first 5-10 minutes of nerves, the pressure wasn’t nearly as bad as I thought it would be. I think it all depends on how prepared one is for the experience. You may have heard other people say “Know your design inside and out”. This could not be closer to the truth. Know it up, down, sideways, back, and front. Be prepared for any question relating to your design, including upstream and downstream impacts. Know the infrastructure components well such as storage and hardware platforms. Anything you list in your design you need to be able to speak to. If you cannot speak to everything in your design, then how do you know it is appropriate for your design? “Because”, and “Best Practice” are not complete answers. I’ve collected a ton of tips along the way (like these) and each of them contributed to getting me as far as I’ve gotten at this point. Social networking tools have helped immensely. I can’t imagine going this alone in a vacuum. I would have been totally unprepared for the design defense, if I even made it that far. So after my defense, I was told “7 days” in regard to getting my results. I was hoping to be pleasantly surprised with results late Friday after the defenses at Mandalay Bay wrapped up. However, having not received them yet and tomorrow is a holiday, it looks like it will take the full week (and hopefully not longer) to get the results. It has been difficult waiting this long. Anxiety is building and I’ve been watching email like a man possessed. I’ve been replaying the scenarios in my head, both good and bad. It’s unhealthy for sure. Although no formal statistics have been released by VMware, I gather through word of mouth that about 50% of the candidates pass their defense attempt, while the other 50% do not. With two individuals from this past week already pronounced as having passed and becoming VCDX certified, the odds are starting to stack up against those like me who still wait for their results. I’m trying to keep my mind occupied on other things but it is difficult. I periodically take comfort in thinking about things far more important, like smiles on my childrens’ faces. For those that pass, I’m sure they look back upon the efforts as well spent and the reward of passing as well deserved. I know that I have already benefited from what I have learned through the process. It has taught me to be more of a thinker which maps directly to my Design and Engineering role at work. I would love nothing more at this point than to have the VCDX certificate to go along with it. I look at the VCDX as a highly coveted certification with a lot of integrity built into the program and process which is sure to last a long time. There is no possibility of a “paper VCDX” as far as I’m concerned. That means value for cert holders and businesses for many years to come. Oh I almost forgot, I brought my own whiteboard dry erase marker on the trip and used it during my defense. I had been using it for practice on my whiteboard at home and thought it may bring me good luck in the defense. Shabby dry erase markers can be a distraction. 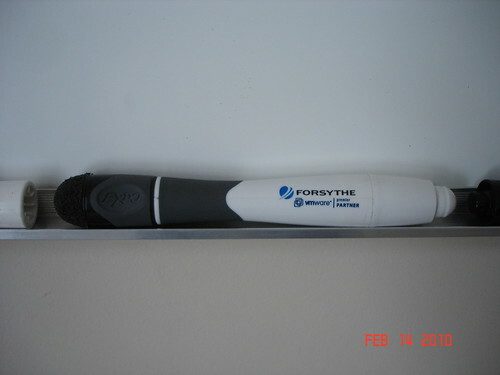 In addition, it has a fine eraser on the opposite end which comes in handy and can save time wiping away small details instead of using the huge brick eraser. The panel didn’t seem to have any reservations with me using it. Click the image to view a larger version. Question: Can I implement jumbo frames on ESXi 4 Update 1 VMkernel networks? Answer: Who in the hell knows? Shortly after, Duncan Epping of Yellow Bricks confirms Charu Chaubal’s report that jumbo frames are supported on ESXi VMkernel networks. Now, nearly two months after Charu’s clarification and three months after the release of ESXi 4 Update 1, the documentation remains dubious on page 54 stating that jumbo frames are not supported on ESXi 4 VMkernel networks which is a direct contradition to a VMware ESXi blog. I opened a Business Critical Support SR with VMware on the question. I was told by VMware BCS that jumbo frames are NOT supported on ESXi 4 Update 1 VMkernel networks and a reference was made to the documentatation on page 54. Our dedicated VMware onsite Engineer escalated and I was then told ESXi 4 Update 1 DOES support jumbo frames on VMkernel networks, making reference to Charu’s article. Hey VMware, which is it? If this is a documentation mistake, why are you dragging your feet in getting the documentation updated two months after a VMware employee discovers the error and blogs it? Waiting for the next release of ESXi? Unacceptable! You update the public documentation as soon as you discover the error and be damned sure your BCS support Engineers know the right answer! Do you know how much companies pay for BCS? You owe your customers the correct answer. If misinformation comes as a result of a known documentation error, SHAME ON YOU! Architecture and design decisions are being made daily on this information or misinformation, which ever it may be. Update 2/23/10: Toby Kraft (@vmwarewriter on Twitter) will be updating the documentation by next week. Thank you Toby! Update 3/1/10: VMware has updated their documentation to reflect currently supported configurations. Thank you VMware (and Toby)! Train Signal has released a new addition to its VMware library of training entitled VMware vSphere Pro Series Training Vol 1 which covers the topics of VMwareView, ThinApp, Nexus 1000V, and PowerCLI. The 11 hours of new content spans 20 videos and is authored by (in no particular order) industry recognized experts David Davis, Hal Rottenberg, and Rick Scherer. General availability was February 9th meaning you can order today at an individual cost of $297, or purchase it in a bundle with Train Signal’s other vSphere videos for $594. Video 1 – Sample content from each of the 3 video authors in the course – a true overview of what you will see in the course featuring VMware View, Nexus 1000V, and PowerCLI. These are a great group of guys who really know there stuff. Order your copy of VMware vSphere Pro Series Training Vol 1 today!